Switcheo Exchange — NEO V3 Launched! We are proud to announce that NEO V3 is officially launched on Tuesday, 26 March. This upgraded contract brings a variety of improvements and features to provide a better trading experience for our users. Start trading on the newly launched Switcheo Exchange today! 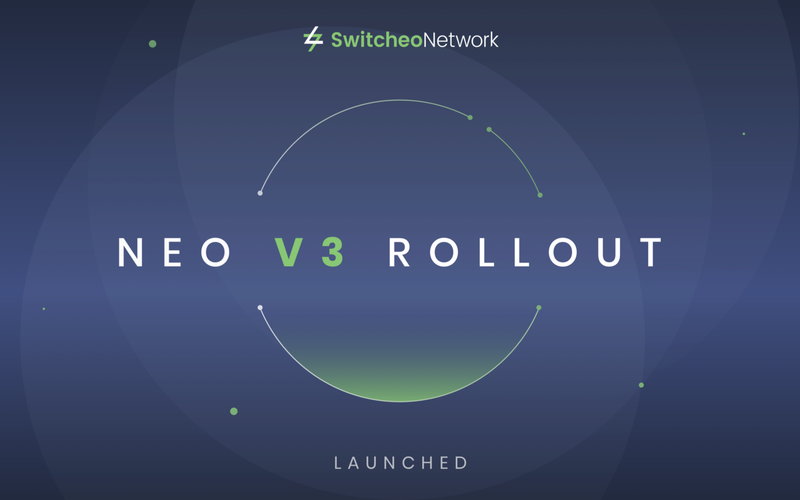 Switcheo Exchange — NEO V3 Rollout! All standing orders on the NEO V2 contract have been automatically cancelled and refunding of all balances to the owner’s wallet has begun. Due to the large number of assets deposited into the NEO V2 contract, a total of 30,000 withdrawals need to be processed, this will take approximately 48 hours to complete. During this time, deposits and trading on the NEO V2 contract will be disabled. Users who wish to expedite their withdrawal after the maintenance may choose to manually trigger withdrawal on legacy.switcheo.exchange, in order to move up their withdrawal queue. Here is a guide on how to withdraw from Switcheo Exchange. Once all automatic withdrawals have been processed, which will take approximately 48 hours to complete, Switcheo will resume trading of the NEO/GAS pair on the V2 exchange contract at legacy.switcheo.exchange, to allow users to extract fractional NEO values from the contract. The team will be supplying additional GAS at or below the market rate (based on third-party exchanges), so users do not have to worry about liquidity.